I Painted Our Kitchen Tile Backsplash!! You may have noticed that I don't share a whole lot of pictures of our kitchen. It's not because it's an ugly kitchen by any means, but because it just doesn't fit my style. So I am on a mission to turn this kitchen into an Emily's cottage dream kitchen. Therefor the dark tile had to go. Now I know when most people want new tile, they tare out the old and put in something pretty and new. Paint is always the answer! So Yes! 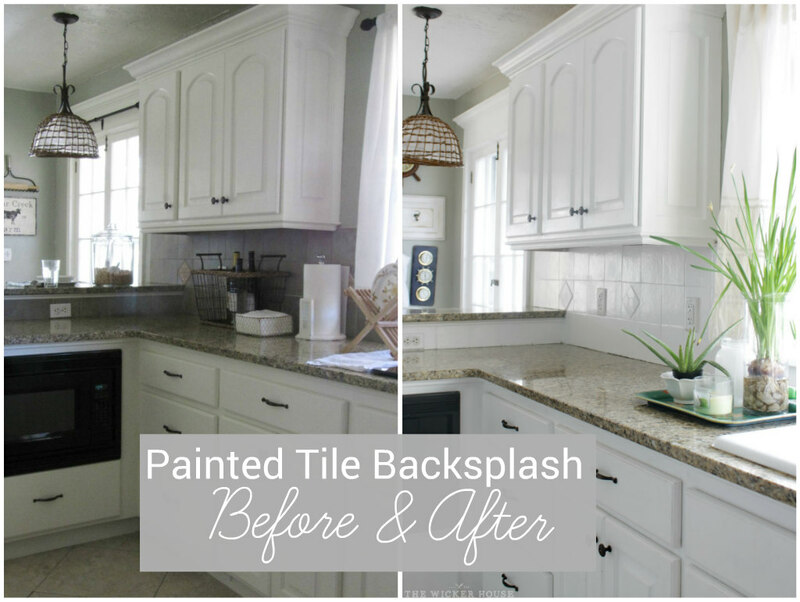 I painted our kitchen tile backsplash and today I'm going to share with you how I did it. The first thing I did was test out the paint on an extra piece of tile we had laying around in our garage to make sure that the primer would adhere to it. 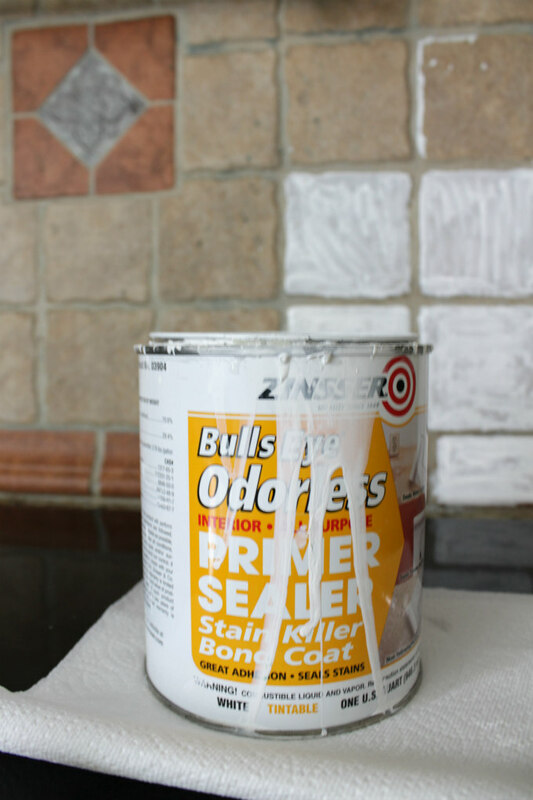 I did a test using Zinsser oil base primer. After one day I did a scratch test using my fingernail to see if the paint would scratch off and it did. Feeling frustrated I gave up on the idea of painting our tile and threw the tile back into the garage. Weeks had past and then one day I was out in the garage and I spotted my failed tile. I picked it up, tried another scratch test and you know what? My fingernail didn't scratch off any of the primer this time. So what I learned was that the paint just needed time to cure. But before I could paint I had to do a little prep work, and when I say a little, I actually mean a Lot!! 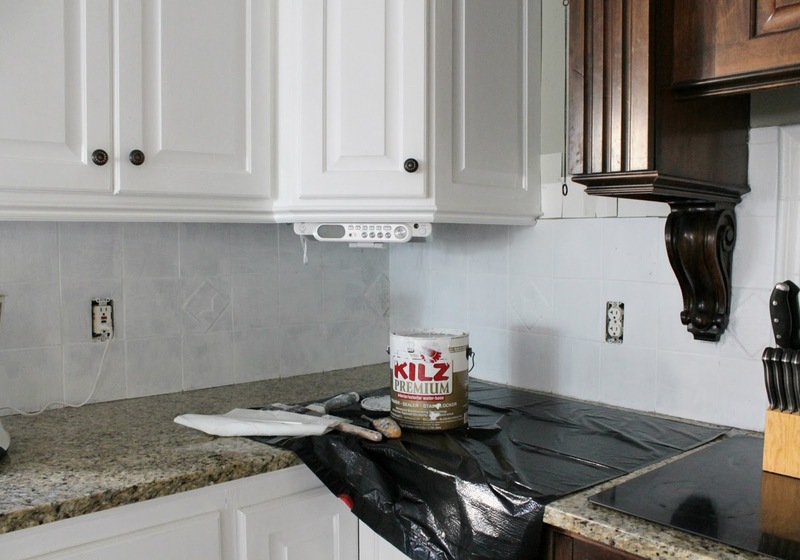 I had to remove the clear caulking that was on all of the edges where the backsplash met the granite counter tops. This caulk was on there so good that it actually took days to remove it. I used a raiser blade and scrapped, scrapped and scrapped some more until it was completely gone. 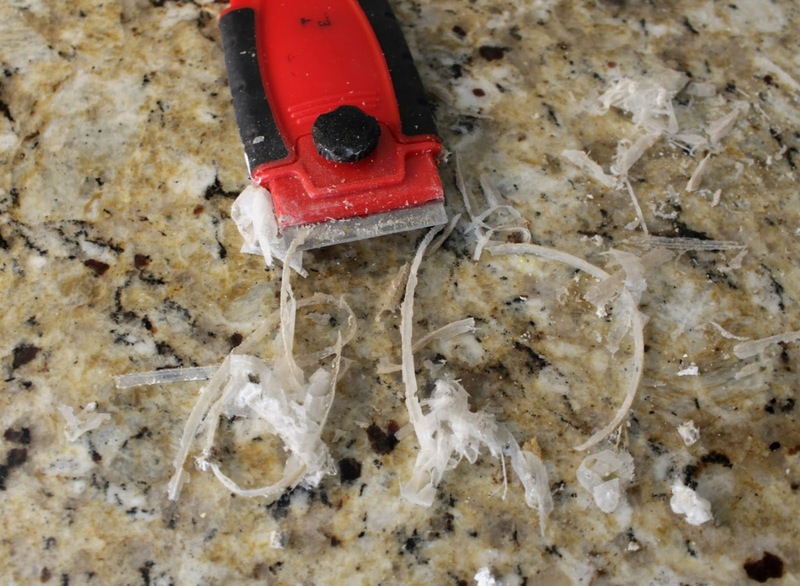 It is crucial to remove ALL of the caulk, because paint will not stick to it. Once I finally got all of the caulk off, the next step was to wash the tile down with a scrub brush and Dawn dish soap. It needed a good cleaning, especially above the stove top where it tends to collect the most grease. I then sanded the tile down with my hand sander and a heavy grain of sand paper. I'm not sure if this helped all that much, but I wanted to do everything I could to get it ready to paint. I removed all of the outlet plates, covered the counter top with a large trash bag and began brushing on the primer. I just used a large paint brush, being careful to brush in all one direction and avoiding any brush marks and drips. After the first coat was on, I let it sit for a couple of days to Cure. Remember my sample? It's best to let it cure 3-7 days. I kept doing a scratch test on the tile to make sure it was cured before applying the second coat. So keep in mind if you try this at home, this is not an overnight project. All in all it took me a couple of weeks to complete the job. Also keep in mind, it's going to look way bad before it gets looking better. I ran out of the Zinsser primer, so I switched over to Kilz primer (pictured above) which I had also tested out on a sample before hand. It works just as well as the Zinsser. So I'd say use whichever of the two primers you have on hand, but if you're needing to buy one, I'd say go with the Zinsser. Oil base is smelly, but I think it has the best adhesive. 1. When finished painting for the day, wrap brush in plastic grocery sack and place in freezer. When you are ready to paint again, pull it out and it's ready to go. Then when the whole project is complete you can choose to toss the brush or clean it up with mineral spirits. 2. Keep Mineral spirits on hand to clean up any messes, and to remove paint from hands. 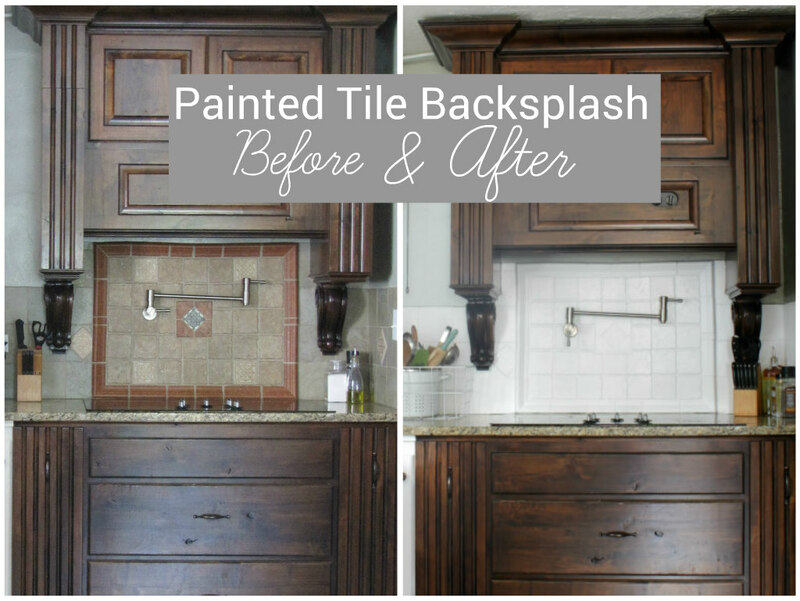 I chose my favorite paint in the world to paint the tile backsplash. It is the same paint I used on my kitchen cabinets as well. 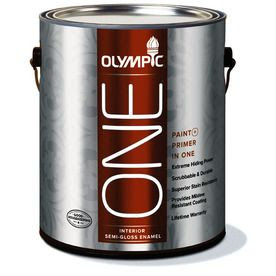 Olympic, off the shelf semi-gloss One Paint. It can be tinted in any color of course, but I think the white that it is already is perfect. The Paint took 2-3 coats to fully cover. I let it dry 24 hours in between coats. The only problem I've seen so far is that now that the backsplash is white, it tends to get dirty fast. The same thing happened when I painted the cabinets white. White shows dirt more easily, but with the semi-gloss finish, it's all really easy to wipe clean. Now that the basksplash is painted white, I'm off to find a new color for the walls. You may notice I have a few samples on the walls already. I'm also still debating on what to do with the wood stove mount and light fixtures. But I'm liking how its coming along. I also want to add something to the tile above the stove top, either hang something up there or add some kind of stencil detail. It just seems to need something, any thoughts? 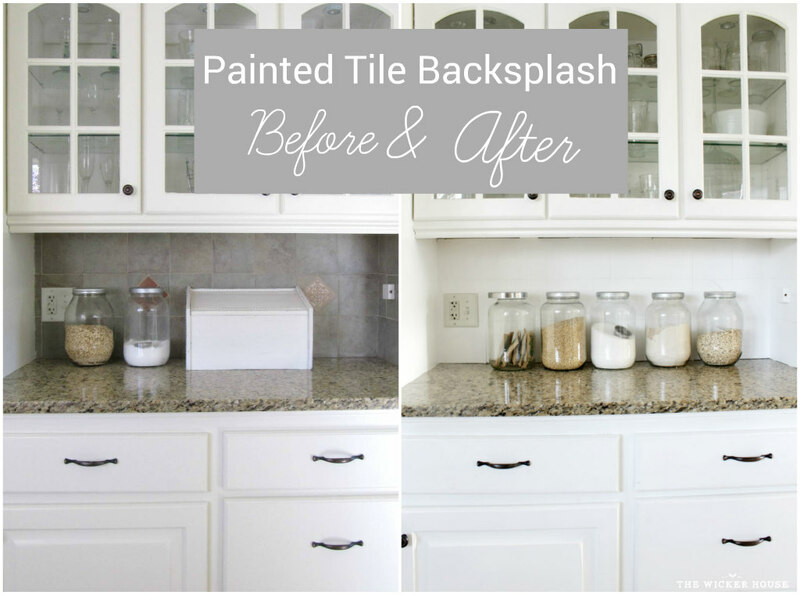 So I hope this post is helpful for any of you thinking of painting your tile backsplash. If you follow my instructions you should be happy with the results as well. Please stay tuned for more changes to come. it looks very nice!I love your kicthen. You are so brave!!! I'd be interested to hear follow up a year later on how it held up - this could be a life changer for many people!!! Good for you, you are brave and resourceful! I have some floor tile I want to try this with. Perfect work! It's look much better in white color. I'm fall in love with your new tile backsplash. The wood stove mount now look too dark, in my opinion. But maybe I'm wrong. Looking good! Is it just me or does it seem like it makes your kitchen seem larger? Love it! I'm going to be putting up a backsplash in my kitchen shortly. I also wanted to paint my cabinets. Their laminate so was wondering if your were real wood or laminate and if you had any suggestions? I know Zinnzer primer is the best. My moms contractor swears by it! That is such a great look. It completely brightens up the room. It is also a great contrast to you dark wood. I have always replaced my tiling when I want a new look in the kitchen or bathroom. I have never thought about painting it but that might be the next change. It definitely sounds easier that the alternative. Thanks for this..I am trying to decide how to do some of my kitchen myself...and I have ugly beige tiles all over..counters AND backsplash! It's amazing what a single coat of paint can do for, isn't it? 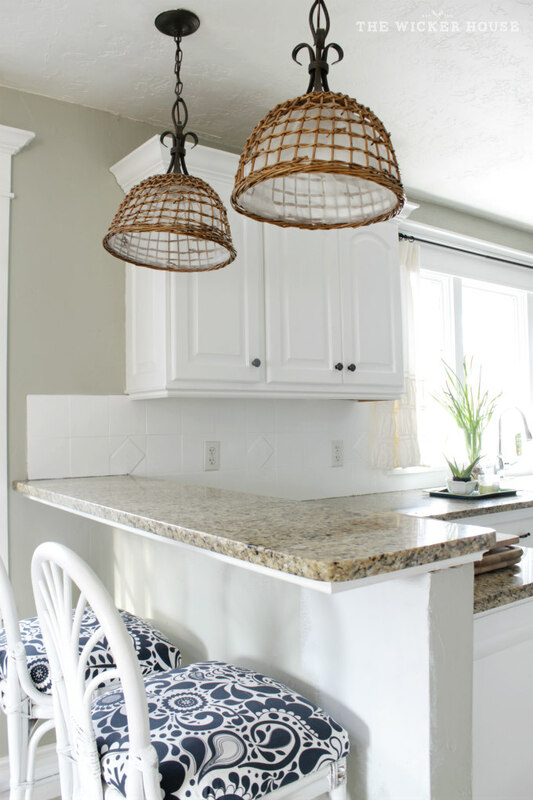 Painting the tile backsplash instead of buying is a great idea, one that I may have to keep in mind for future reference! You did a great job, and it really brings light to the room. Sit back and enjoy it – it looks amazing! 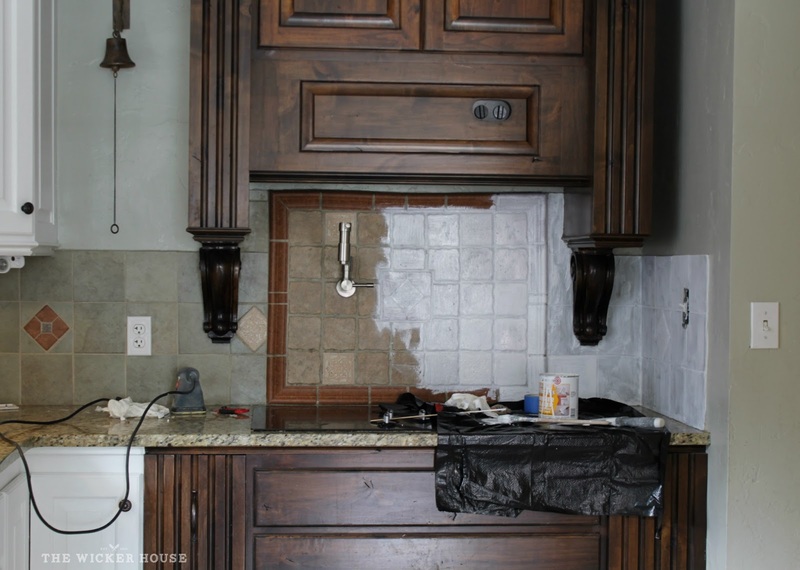 Your kitchen is a pleasure, with or without a backsplash! However, in the event that we're taking a vote, I'd lean toward the tiles in the second tile photograph, that extremely pale ocean green. It's SO beautiful! Thanks for this..I painted my kitchen back splash with white chalkboard paint. it's so Beautiful kitchen backsplash ideas﻿..
Nice work .Thanks for the share. Keep up writing so that we can get more informative blogs like this one. 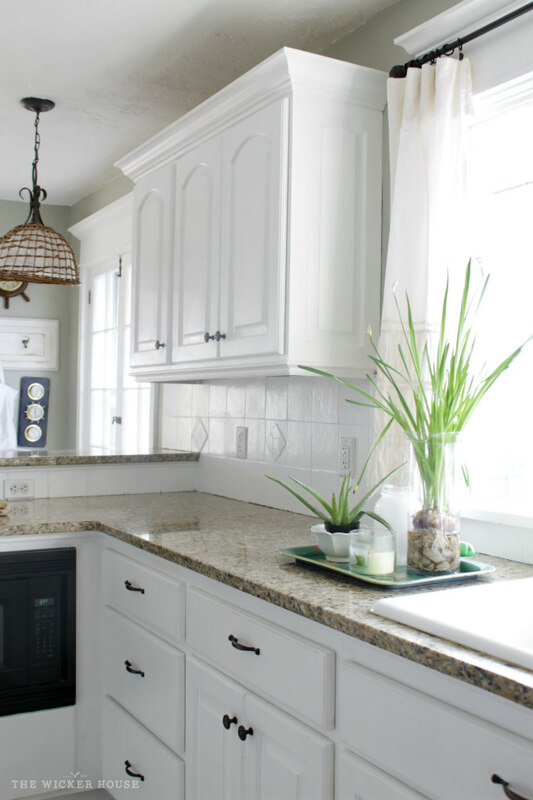 kitchen backsplash ideas﻿.. Such an amazing blog with great designs and offers of kitchen tiles. Find Professional House Painters in Brisbane, Gold Coast with Shine Painting. You did an amazing job! Totally inspiring! 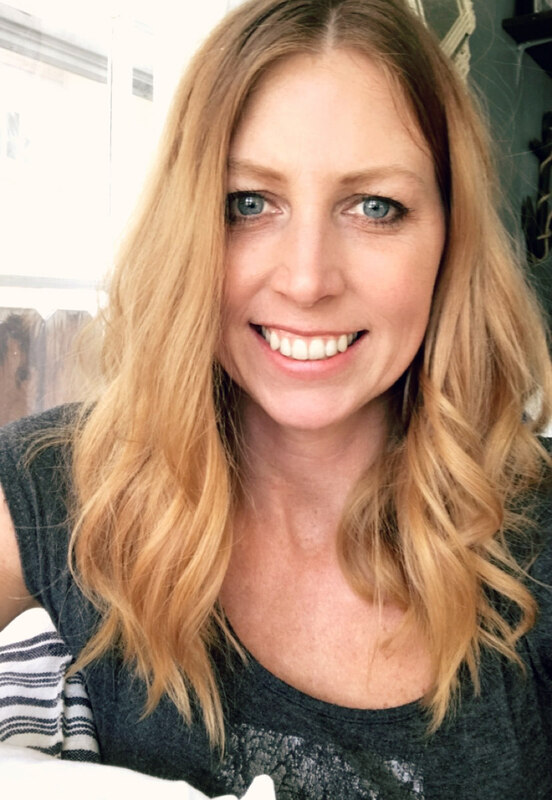 I just stumbled onto your blog as I turned to internet searching (again) as I have been getting very discouraged with my kitchen painting project. Tiny bit of background, we recently moved into our home and really like most of it, but the kitchen is really dark! 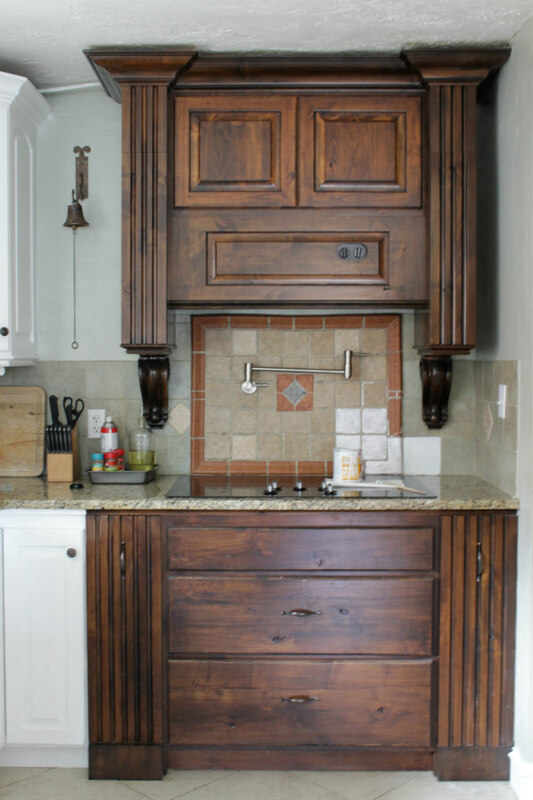 Very old and dark cabinets with newer tile back splash and granite. Well there is no way we can pay to change the tile that just fine but not my favorite color and seems to clash with all colors I like for walls and the white cabinets I have in mind! 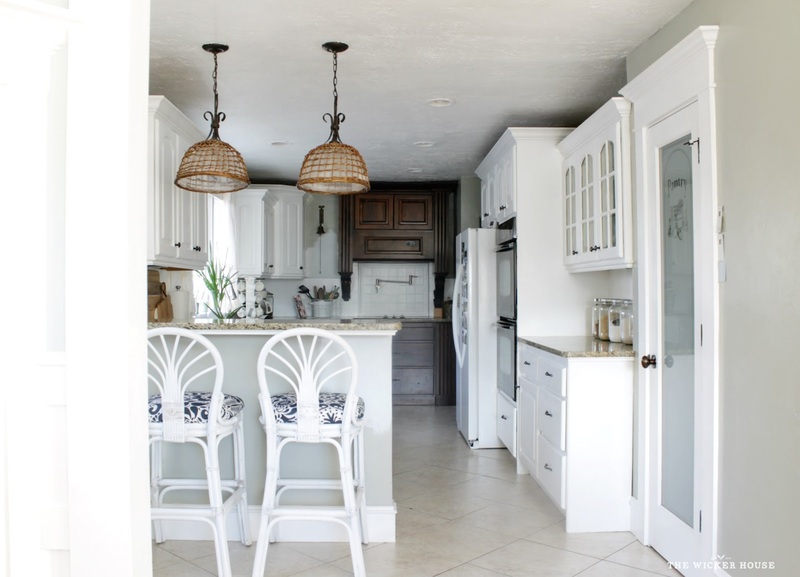 So I searched again for painting tile (unsure if I should even mention the idea to my husband)....I found your blog and low and behold...you have tile near the same color as mine and your granite is the exact same as mine! So I am thinking my project may not be a lost cause if I can change the tile like you did! So please, can you let me know how the paint is holding up on the tile in your kitchen? And also, what kind of brush did you use? I know the brush can make a big difference. Thanks for your post and thank you for your help!